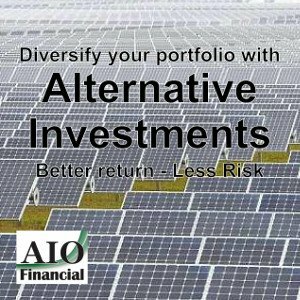 Alternative investments are investments that is not one of the three traditional asset types (stocks, bonds and cash). Most alternative investment assets are held by institutional investors or accredited, high-net-worth individuals because of their complex nature, limited regulations and relative lack of liquidity. However, recently more alternative investments are available to retail investors. Many alternative investments also have minimum investments and require investors have a certain amount of assets or income. While they are subject to less regulation, they also have less opportunity to publish verifiable performance data and advertise to potential investors. Alternative investments are favored mainly because their returns have a low correlation with those of standard asset classes. Because of this, many large institutional funds such as pensions and private endowments have begun to allocate a small portion (typically less than 10%) of their portfolios to alternative investments such as hedge funds. Be very careful of fees for alternative investments. Investing in alternatives through a commission broker (commission or fee based) can take a large portion of your return. Many commission brokers receive over 7% for placing clients in alternative investments. Some investments pay an ongoing percentage (some over 4% per year) to the selling brokerage firm. Also be aware of any other fees. Many discount brokerage firms (like Schwab, TD Ameritrade, Scottrade) offer alternative investments to be held in their accounts, but many times there is a fee. Consider this fee, depending on the amount you are investing, it may make more sense to invest directly with the alternative investment company. Here are four SRI alternative investments. I will have blogs and podcasts about each of these in the coming months. Greenbacker Renewable Energy Company acquires and monitors a diversified portfolio of income-producing renewable energy power plants, energy efficiency projects and other sustainable development investments. They buy clean energy power plants and sell the energy to cities, utilities, and companies through long term (20-30 year) agreements. The minimum investment is $2,000. The fund is expected to liquidate in 2019. There will most likely be other iterations of this offering. An investor needs to be accredited light – have at least $250,000 of investable capital or earn at least $70,000 per year. The fund currently pays investors 6.3% per year (on a monthly basis). TriLinc Global is an impact fund whose mission is to demonstrate the role that the capital markets can play in helping solve some of the world’s pressing economic, social and environmental challenges. By creating institutional-quality impact funds that attract private capital at scale, TriLinc Global sets a high standard of transparency and accountability for delivering financial returns, and for tracking and reporting impact to investors. The fund currently pays investors 7.3%. As with GreenBacker, investors need to be accredited light and there is a $2,000 minimum. SQN Capital buys business necessary equipment and rents it to secure companies or governments for a period of 5 years (with covers to cost of the investment). At the end of the term, the equipment is sold, the loan is extended or the loan is sold. SQN has invested primarily in in the agricultural, energy, environmental, medical, manufacturing, technology, and transportation industries. SQN actively manages investments throughout the United States and European Union. SQN pays approximately 8% per year. Iroquois Valley Farms is a food and farmland company making impact investments in local and organic agriculture following triple bottom line principles. Formed in 2007, Iroquois Valley Farms was the first socially responsible farmland company in the United States focused on supporting sustainable food production and the mid-size family farmer. Iroquois Valley Farms is committed to preserving farmland, facilitating organic land management practices, supporting local food markets, providing land access opportunities to family farmers and creating values-based agriculture investment opportunities. They provide the opportunity for equity investors to invest. The investment is not liquid (you cannot sell your investment right away to get your money back). The investment duration is not fixed uncertain.